Click links below, and it will go right to it. 2- Short vid – sometimes a knife will ring. up. How to do this ? 5 – Do you have gift boxes ? 6 – Why can’t I check out on the web page just by pressing a button? 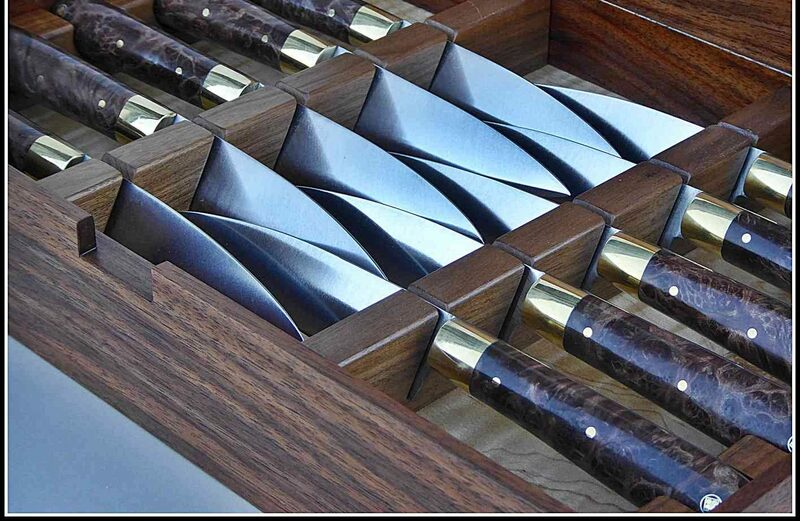 7 – How can I resharpen my knives? 8 – Do you take on commissions for custom pieces ? 9 – Do you have a full tang on your knives ? 10 – I dropped my knife on a cement floor and the tip bent over. What to do? Below – video on how to clean a rusty funky knife using a Scrubby sponge and Bon Ami cleanser. You could also use sandpaper or a sanding pad, starting with 100 grit, then 240 and lastly 400. Short vid – sometimes a knife will ring. Above: short video about cutting out a knife on a modified metal cutting band saw. I installed a table to cut on, a chair onto the saw bed and removed the horizontal attached vise. Lastly, if you want knife re-built, see here for information dealing with reconditioning your older knives, click HERE. If the seams between steel and wood seam opens up, then dry wood handle out for a day (in other words, do not use it). Then take some store bought wood filler/putty of any color, and fill the crack to seal it up. Wipe off excess before it dries. Then sand off excess gently. Never try to clamp the gap closed and glue, as this will not work. The idea is to keep water from migrating into the opening as soon as possible not to close the gap. This method is easy, cheap and works perfectly. You can also use wood glue and saw dust. Q – Do you have gift boxes ? I tried to stock gift boxes, years ago. I tried a few different strategies. One was to have a box for every size combination I could make. I wound up with over $1000 in boxes which took up to much room. I then tried hemp roll up’s, and then corduroy roll ups. Both sewers closed up after awhile. The more knives I made, the more I needed. I tried to work with custom box makers, but making a client a custom wood box for one piece means a high cost per box, and few wanted to have them made. I gave up on cardboard and instead tried to work with cabinet makers who wanted to make one of a kind boxes for sets. →Here is a link to a cardboard box which will fit an 8 or 9 inch kitchen knife, with a 5.25″ handle. I have not been able to find an assortment of these anywhere. If you know where I can send clients to buy different lengths boxes, who sell one and two boxes at a time, let me know please. Soft cordova fleece lined zipped bags are available around the web, but there are few that can be used to present a 9-12 inch kitchen knife. Try this link on E-bay & this link to USA knife makers. Why can’t I check out on the web page just by pressing a button? Now you can check out by pressing a Pay Pal pay now button for in stock items only. A – I could make one button for each size knife but the options would be voluminous, and I could not even offer them all. For example, if you want stabilized wood on your handle (and this is a very popular choice for clients) you have to look around the web site of the man who sells stabilized wood. Each of his choices are unique and vary in pricing. Options I could offer with each size knife then would be: length, width, thickness of steel, handle wood, dozens of options for each add-on, etc. I tried it once many years ago, but it got a little nuts every time I needed to change something. The more choices and buttons I offered, the more complicated it got to maintain. Now, no more buttons and everyone goes through me by e-mail or phone, which never takes long at all. Takes about 10 minutes and a few e-mails. In other words we collaborate and hatch a game plan. I will follow up then & send you an e-mail, reviewing all the details of what we talked about including order specs and cost. This can then be reviewed and adjusted or we can go with it & I will follow up with a Pay Pal invoice laying out all the details. The invoice has a button to pay the invoice. So much simpler and you get to customize something that you will have a for a long time. Many folks are like me and look at my web site as a learning experience and absorb enough to come up with their own plan. I can easily parse through your plan, offer sensible options to save money, and then follow up. Pay Pal is safe and becoming ubiquitous when it comes to online banking . If you pay through them, your information is safe for domestic and foreign sales. If Pay Pal seems new or confusing, please view Your Tube video → HERE, which explains how to pay with Pay Pal, if your not a member and do not have an account. **Having said all this, if you do not want to have anything to do with Pay Pal, then a check or postal money order works well also. This will slow the process down a little, while check is mailed and arrives and clears. How can I resharpen my knives? Do you take on commissions for custom pieces ? Do you have a full tang on your knives ? a.- yes we do. It is the strongest way to make a handle which will last. We put a slab of wood on either side and then glue and rivet it in place. It would be very hard to hurt the handle. One could burn it off or the easiest way to hurt it would be to leave it in water. Then it would dry, and probably pull away from the steel in the middle. Then rust can enter, and somewhere down the line it will corrode. Better to treat these knives like a fine tool, which is what they are. Have a special place to put it when not being used. We do guarantee all our work for workmanship for life, and if the problem is due to anything we should have done or did not do correctly-we will stand by it. I dropped my knife on a cement floor and the tip bent. What to do? a – A bent tip is normal behavior for a well heat treated knife. It should have bent when given that sort of stress. You can knock it back again like a blacksmith would, with a hammer hitting lightly. Then re-sharpen tip only with stones or emery board. Or send back to me with a check for return shipping, and I will re-point for free. BTW, if the knife was not well heat treated, it would have broken off. Having said that, if the bent point is waggled back and forth, if will eventually snap off. In this case, file a new point and start the motor.